Sauté tempeh cubes until golden brown. Drain on paper towels. Prepare vegetables. 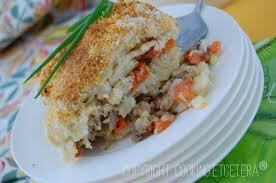 Place in casserole dish with tempeh. Mix Savory Broth. Pour over vegetables. Cover and bake for 45 minutes until potatoes are fork tender. Alternately, sauté the vegetables in the pot after removing the tempeh. Cook until onions are soft. Add tempeh and Savory Broth. Simmer on top of stove, stirring occasionally for about 30 minutes, until potatoes are tender. *Both tempeh and miso are soybean products , available in health food stores. Tempeh, which originated in Indonesia, is a sliceable cake used as a meat substitute. Miso is a soybean paste used to enrich the flavor and aroma of foods. It can replace salt in many recipes.